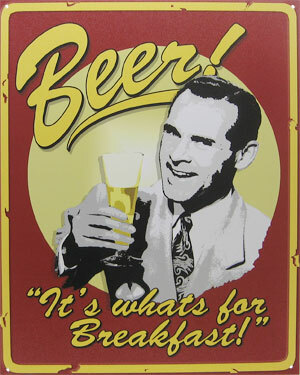 Let's talk about two daily essentials: Breakfast and, of course, beer. Mass marketers of breakfast cereals have been in a downward sales spiral for about a decade, so they're getting back to their roots (sort of). Few folks know that some of the oldest and biggest brands of today's artificially flavored, neon-colored, empty-calorie cereals started out as health foods, often springing from religious or utopian movements. For instance, Ralston Purina's Wheat Chex cereal was first packaged in 1937 under the name of Shredded Ralston, specially formulated for followers of Ralstonism. What was that? A strict, bizarre, racist cult with a demonic mission: To make America a nation of Caucasian purity. Webster Edgerly, the unhinged founder of Ralstonism, proposed an efficient means for achieving his pure-white dream world: Castrate all males of "impure" lineages at birth. The big manufacturers today aren't going full-tilt Ralstonist to reclaim market share, but they are going back to pitching their products as health food, hoping to woo millennials who want cereals with more protein, fiber, and natural ingredients and none of the artificial additives the industry has been dumping into its Choka-Mocha-Salted-Sugar Bombs. Some brands are seeking Good-For-Ya credibility by buying out organic brands such as Kashi (consumed by Kellogg's) and Annie's Homegrown (swallowed by General Mills). But the sweeping shift of this $10-billion market to healthier alternatives is, in fact, an enormous, grassroots victory, driven by the organic movement, groups like Center for Science in the Public Interest, Good Food entrepreneurs, fearless nutritionists and especially by countless moms, dads and kids who simply refused to swallow the industry's crap. Now that breakfast is out of the way... beer! Last year, Anheuser-Busch InBev mounted a multimillion-dollar coup on America. Not on our country, but on its name. For six months, the beer behemoth expropriated our nation's name for a tacky advertising campaign, rebranding its Budweiser product "America." But the PR ploy backfired when a flurry of stinging media stories pointed out that Bud is owned by a Brazilian consortium based in Belgium. Undeterred by facts, BigBud — still claiming to be red-white-and-blue-blooded American — announced that it has invested beaucoup bucks here to improve its beer quality. Mostly, though, that enhancement has come from buying out ten local craft breweries, such as Goose Island in Chicago, Karbach in Houston and Wicked Weed in Asheville. AB InBev grabbed these top-quality, independent brew-makers because they represent the real beer of today's America, rapidly taking customers away from the giant purveyor of bland suds. Indeed, sales figures tell the tale of Bud's beer bust: Last year the company sold 14.4 million barrels of Budweiser in the US, less than a third of its volume in 1988's peak-suds year. Meanwhile, craft breweries are gaining market share — production of good beer was up 12 percent last year to 24.6 million barrels.